I awoke to blue skies and sunny weather which is just as well as I was not in the mood for rain having to repair the lift pump again. Usual routine – strip it down – clean with degreaser – dry then mix up the liquid metal. I put on two layers this time in the hope that it would withstand the vibrations of the engine. After an hour to cure then gently run the engine to warm it up and hopefully cure even more then its off to Nether Lock. 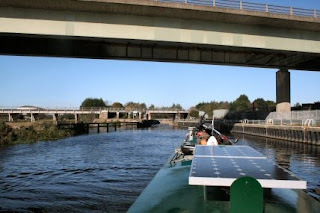 The entrance to the lock is hidden around a very sharp right hander so after passing through under the Newark bypass bridge I make ready to get the lock set. Surprise that lock is manned and open ready for me. It doesn't take much to make me happy. This far the engine is just on tick over and the lock keeper must have wondered why I was going so slowly. Mind you with the flow of the Trent the speed I was doing was about average for me. Out of the lock and speed up slightly. The engine is sounding just right for a change and running nicely – touch wood. As time goes by I bring the speed up to that which I will use tomorrow on the tidal part of the trip. At North Muskham I meet the first large boat of the journey so far. BW barge with a large crane on board. The Trent is quite wide here so no effort is needed to keep out of his way. 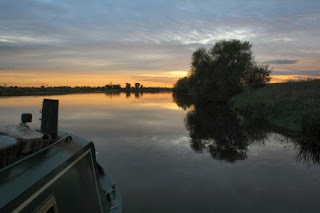 Soon at Cromwell and turn the boat into the flow to go along side the mooring. Not quite long enough but it will do for me. 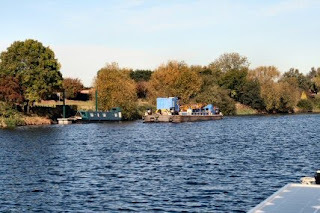 A visit to the Lock keeper and I received the info that the tide for me was at 0830 tomorrow. At 1800 the view over of the bows shows how calm the Trent can be. Out at Cromwell there is little light shown and what looks like Venus or Mars is very bright in the south-ish part of the sky.